After catching plenty of ears with his DiCaprio 2 tape before the end of 2018, J.I.D has now announced plans to bring the effort to Canada with a North American tour. As part of the second leg of his "Catch Me If You Can Tour," J.I.D will play six Canadian dates in the month of May. He'll make stops in Toronto and Montreal before heading west to play Winnipeg, Calgary, Edmonton and Vancouver. 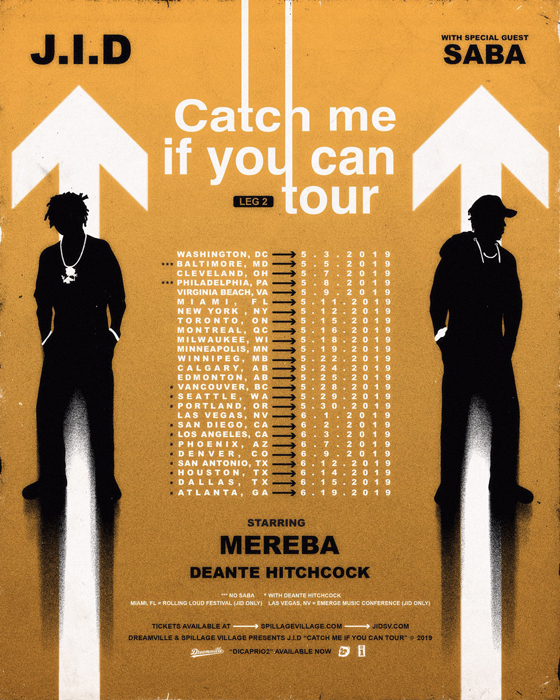 Support on the run will come from Saba, Mereba and Deante Hitchcock. Tickets go on sale Friday (February 15) through the rapper's official website. Find a complete itinerary below. Saba Plots "Bucket List Tour"